It’s Five Minute Friday! Or in my case, Five Minute Saturday because life. And also kids. This week’s word is “Include” and if I’m perfectly honest, I may have been putting this off just a bit. But I’ve been for a run, I’ve got “Stronger” by Britney Spears blasting on repeat in my ears, and I think I’m ready to do this. Those are loaded words for me. Words that have carried so much meaning and heartbreak over the years. Words that also carry hope and empowerment. I have been the seventh grader in class on Monday morning with all the kids around me talking about the birthday party they went to, realizing I was just abou the only one who wasn’t invited. I have been the 18-year-old girl, the week before her freshman year of college, sitting on the floor of her dorm room listening to her Rush Counselors tell her that not a single sorority on campus had asked her back for the rush events that night. I have been an adult, watching as friend groups have congealed around me, feeling like I should be a part of them and desperately wanting to, and feeling the weight and conviction of my own failures to fit in, to be include, that followed me into adulthood. I have felt the sting and condemnation of exclusion. But then…but now…God has changed my story. This is Five Minute Friday so I don’t have time to get into the details, but since I became a mom, inclusion has allowed me to break free of the chains that exclusion had wrapped around my heart. I have seen how the healing power of audacious, extravagant INCLUSION can create a space for growth, for healing, can help us break free. And so now here I am, preaching inclusion. In the Kingdom and in the world. Because I believe that inclusion changes lives, it’s changed mine. There’s more there, some day…thanks for reading. Ah, the comment section of social media posts, where common decency goes to die. The intoxicating combination of strong opinions and unrestricted access to a keyboard causes grown adults forget their manners AND their Jesus all over Ellen or Jen Hatmaker or Today Parents or KGW Newschannel 8 or whoever has evoked their righteous opinionation. I wonder what would happen if, at the end of each day, everyone had to show their mom what they commented on Facebook. I’ll bet things would look a lot different. This is particularly true of PARENTING POSTS. Almost everyone has either had a parent or been a parent and so eeeeeeeeeeeeeeverybody has an opinion, experience, advice, etc. I’m not just talking about strangers on the other side of a computer screen here. 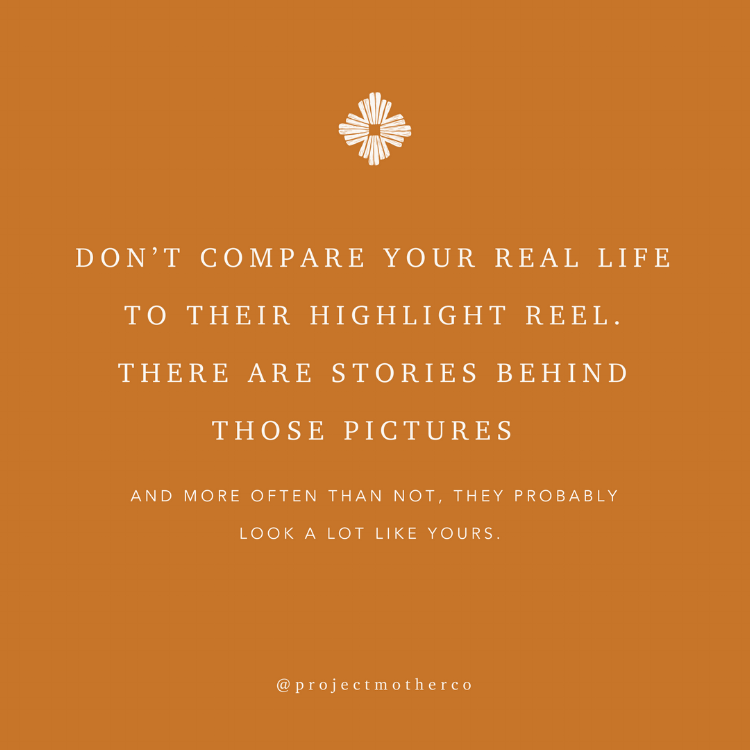 Sometimes the responses we get from our very own friends and family when we post about the realities of our parenting journeys can be disheartening. We get strong opinions and advice WHETHER OR NOT WE ASKED FOR THEM and too often they are not presented with much love and care. For a mom whose heart is cracked wide open with love for her babies, who is tired and tender from the struggle she’s in, it can feel like a punch in the gut. Over time, however, you start to notice patterns in these responses. The same people say the same types of things, DIFFERENT people say the same types of things…and you start to think that maaaaaaaaaaybe, just maybe these comments that people are leaving are actually more about them than they are about us. 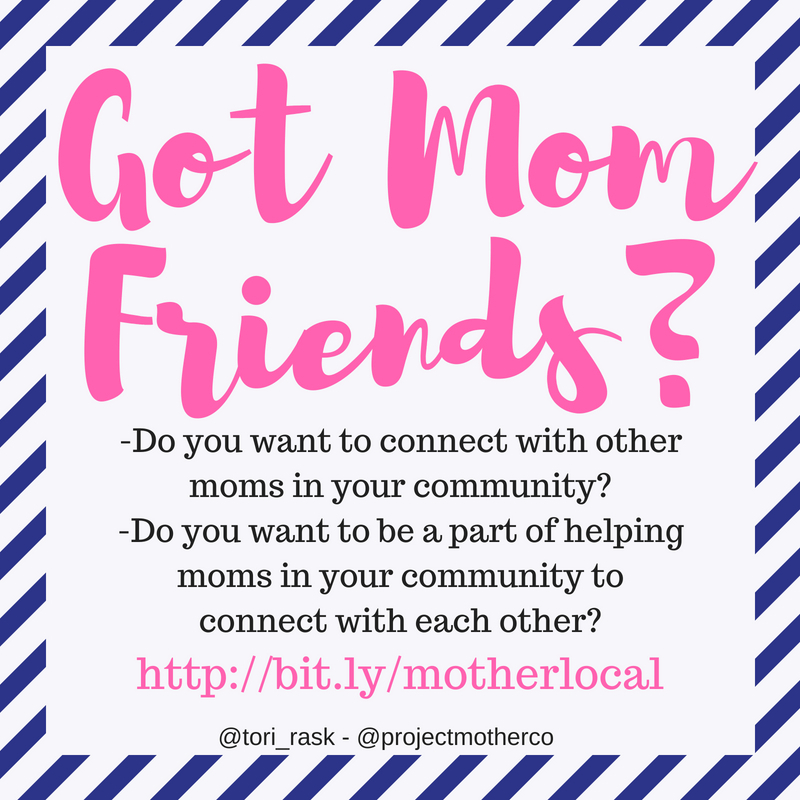 I brought this topic up to a group of moms who have solemnly sworn to be brutally honest with me as I write about motherhood (I’m lookin’ at you, TBMFers), and what follows are character sketches of five of the most common types of commenters we have encountered on our social media posts about parenting. -This list is by no means exhaustive. Good heavens, it’s nowhere NEAR comprehensive of all we’ve experienced as we’ve shared our parenting journeys out loud. This is the mom who seems to see another mom’s post as a chance to talk about great she herself is. She doesn’t really have anything helpful to say, but she does see a chance to be seen and heard for her own parenting prowess, so she chimes in. This type of response is 100% about her and not about you. Whether she realizes or not, this mom feels like she has something to prove so she’s looking for any opportunity to remind herself and everyone else that she’s good at this mom thing. How to respond: Bless her heart and keep on scrolling. Whether you’re asking for advice or not, this commenter has it. And it’s perfect. Worked perfectly every single time for every kid they ever had and if it hasn’t worked for you, you CLEARLY must not have tried it yet. Also, this person rarely bothers with any fluff along with their sage advice. No, “I’m sorry you’re struggling.” No, “Oh, been there, girl!” Nope, this commenter just drops their wisdom in as few words as possible, drops the mic, and walks off to bless someone else with their infinite wisdom. In either case, this type of response tends to sting a little because the moments feel BIG and BAD (or GOOD) for us, and it’s just not awesome to have someone come through and point out that it’s going to get worse (or better). (And, for the record, sometimes they are wrong. Pregnancy insomnia was worse for me than newborn sleeplessness). While their intentions are often pure, sometimes they are doing their level best to be excited with us, the “Just Waiter” could stand to take a step back and just let us have our moment. There you are, doing your best to follow the latest research on what’s best for your kids, and here comes The Veteran to tell you she doesn’t understand the fuss over this newfangled flibbertygibbert, her kids turned out just fine without it so it must just be some witchcraft nonsense. Truth be told, I can actually feel where this mom is coming from. Nobody wants to hear that the way they raised their kids wouldn’t fly by today’s standards. But here’s the thing: I fully expect to experience the same thing when I’ve achieved Veteran status. I expect that science and progress will unlock better and safer methods for future generations of moms. But that won’t mean I was a bad mom, nor does baby-led weaning and back-is-best sleeping mean that the moms of previous generations were bad either. We all do the best we can with whatever information we have at the time. So I kind of want to hug the Veteran Whose Kids Turned Out Fine and tell her she was a great mom. But also remind her that progress is a good thing in other areas and it’s a good thing in parenting as well. The One Who Really Sees You. Sometimes she has actual practical advice for you, and sometimes she just says, “I’m so sorry you’re going through this, that sounds so hard.” When things are good, she applauds and gushes over your kids’ accomplishments and yours, and reminds you that you and your kids actually ARE every bit as special as you feel in that moment. She tells you you’re a great mom and that your kids are lucky to have you. This is the mom who shows up in your tough moments and makes you feel like you’re not alone, like you’re not ACTUALLY failing, and like you might just make it out of this season of parenting. She’s authentic and honest about her own struggles, knowing that being herself will give you permission to be yourself. Her goal is not to give the best advice or make you feel better about HER, her goal is to shine light into your darkness and make you feel better about yourself. This is the kind of mom you want in your squad, the kind of friend you want to give your best love back to, and the kind of commenter that makes us feel like we just might survive the internet after all. How to respond: Bless her heart and hold on tight. In the end, we would be remiss if we hated on these moms too much. Fact is, their hearts are just as tender from their parenting experiences as ours are. And also, who knows but what we may have inadvertently stepped on someone else’s toes when we commented on their post either. So nothin’ but love, mamas. Nothin’ but love. Sounds like you’re a great mom. These words cover a MYRIAD of sins, mistakes we might inadvertently make, because they are dripping with love and grace and what everyone needs to hear. 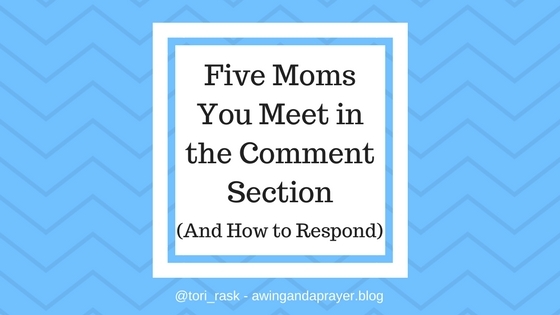 If enough of us said this to each other, the comment section would become a much more encouraging place for moms to be- and Lord knows we need more of those spaces. Go forth and love other moms. It’s Saturday night. The kids are in bed, you’re sitting on the couch in your jammies with a cup of tea or decaf coffee. Or wine. Or straight whiskey on the rocks. Whatever floats your boat. You’re scrolling through your social media feed and seeing posts showing what everyone else is up to this weekend. And there you sit. Alone. Just you (and maybe Carlo Rossi or Jack Daniels or Earl Grey), looking around the friendscape of your own life and finding it to be pretty bleak. Nobody called to invite you anywhere this weekend. Or last weekend. Or the weekend before that. If you had decided to up and go out yourself, you’re not even sure who you would have called. Maybe you’ve got some anxieties gripping your heart and mind and you’re not sure you could have gotten up the gumption to go or would have had to leave early, even if you had been invited. You think back to rejections and betrayals in your past, the hurts come rushing back and start to make you think there’s something wrong with you- or maybe there is something wrong with other people. You just can’t trust them. And you head for bed, turning these things over and over in your mind, wondering why it seems so easy for everyone else and yet it’s so danged hard for you. And your heart is heavy, your soul is weary, and you are lonely. Been there? Me, too. Girl, I have been there and back again.